For one, it was both small and big all at the same time. Actually, small might be the wrong word to describe it. It was small in the grand scheme of conventions, yes, but I’ve been to quite a few small conventions now. This is the first one though that felt more like an intimate gathering of friends than it did an internationally attended event. Many hugged hello like long lost family, there were inside jokes a plenty from past Filk events and most people knew the words to many of the songs played and sang along. And also knitting…there was a lot of knitting. But it was also big in terms of legacy. The sheer sense of history I felt while at the con was actually a little overwhelming. Like I said, Filk has been around for decades. 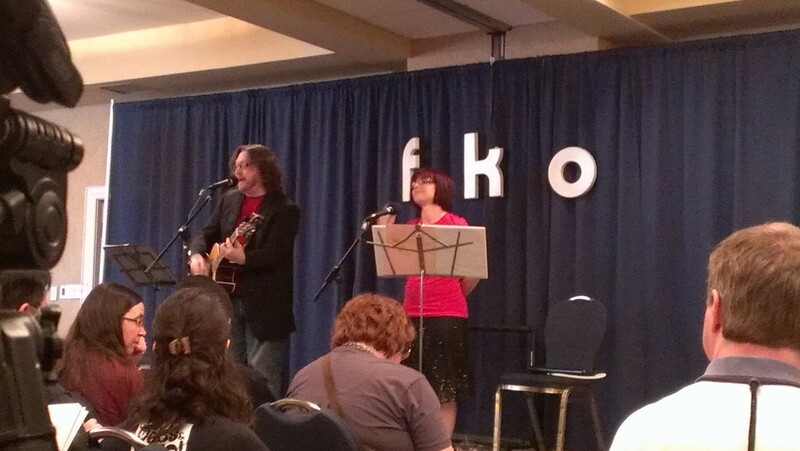 The majority of people I met at FKO have been a part of Filk since before I was born which amazes me. I’m not sure why I had such a hard time wrapping my head around the concept of older nerds. I seemed to grow up in this geek bubble in which our parents were not geeks (although my dad is…but he’s shyer than I am) and that the true geek generation began with mine. 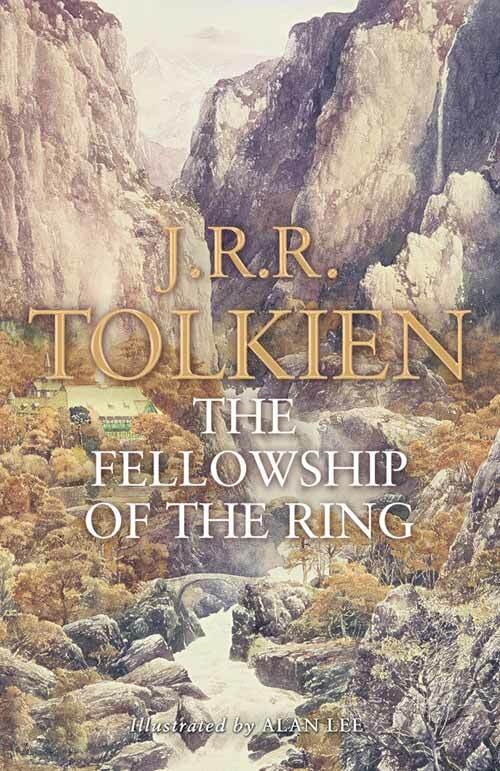 Which is ridiculous…especially considering that some of the greatest sci-fi/fantasy novels out there came out well before my time. Errol introduced me to as many people as he could. If you’re going to a small, intimate gathering convention where you know almost no one, it’s good to have an Errol around. Yes, he will prey on your awkwardness, but the man can socialize like no one’s business. BUT thankfully not everyone was a complete stranger. I’d met a few of the local Toronto Filkers already so it was good to get to know them a bit more. I also got to hang out with the great Debbie Ohi, who was there with her band Urban Tapestry and is Errol’s female doppleganger. Seriously, look! Same exuberant smiles AND same insane amount of creative projects! There were also hug codes. Yes, this is a convention that has rules for hugging. You all know my stance on hugging, so this was a bit of an adjustment. As I said, everyone knew each other fairly well, and those that didn’t were always looking to meet new friends. As we picked up our badges, we also saw a sticker station. As it turns out there were also specific stickers that would indicate whether you wanted a hug, didn’t want a hug, or were okay with it but had to be asked. I…well, I didn’t know of the hug rule until AFTER I found the stickers. Let’s just say I got a lot of hugs. Being a music convention, there were concerts and song contests galore. Debs and Errol performed much to the joy and amusement of everyone present. Urban Tapestry, who I had never heard before, were celebrating their 20th (TWENTIETH!) year together and rocked everybody’s socks. Filkers from all walks of life took their turns at the microphone, including my friend Kari, who played my current favourite song of all time. Seriously, listen to this and all her other stuff. Then of course, there were the Filk circles themselves, which were even more intimidating to think about (and ran ALL NIGHT, it was epically amazing and tiring). I was the new kid on the block (well, along with our friends Kari, Leslie and Devon). Not only that, I am extremely lacking in musical talent and knowledge. Generally when I am surrounded by people possessing amazing talent, especially music, I tend to get shyer than normal (yes…that is possible), embarrassed for the umpteenth time that my parents chose swimming lessons for me because they thought not drowning in a town surrounded by water was more important than practicing scales. Pfffft, parents. This is Rand of Ookla the Mok. He and Erin were also awesome. 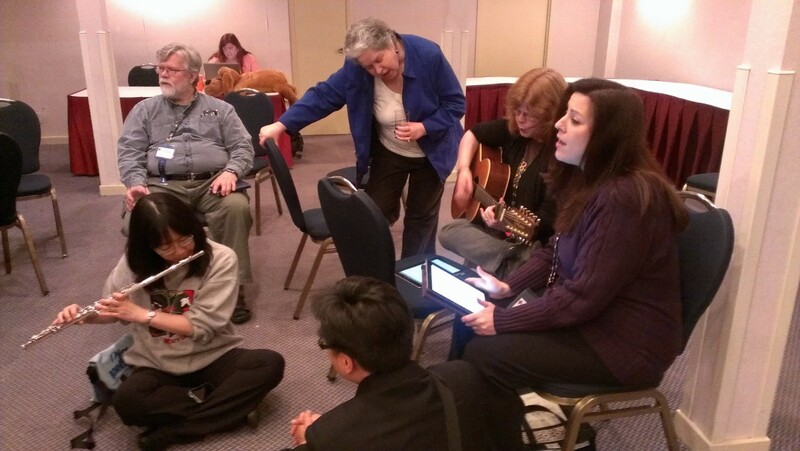 But a Filk circle is not like other jam sessions. Yes, there are some incredibly talented folks there who create some fantastic music, and I am in awe of their abilities and passion. But for every super amazing genius musician, there were probably about ten people who were there simply to sing and listen to the songs they loved. They might not be musicians, they might miss notes, or sing off key, but their passion and enthusiasm was just as strong and they were encouraged and welcomed to participate regardless of musical prowess. My first filk circle! Woo! That inclusiveness is the main reason I have grown to love Filk. It’s not as much about producing professional sounding music than it is about simply getting together to celebrate the joy of singing and playing. Those who would normally be too shy or afraid to speak openly about their passions have a safe space in these circles. Someone will start to sing, others will join in, whether to harmonize or to play an instrument to accompany, and soon something happens. Whether you are performing or listening, you suddenly become part of that song. And you feel, whether you mean to or no, like you belong. The closest I can think of is my university residence, Artz Haus, which very much had the same sorts of practices. Also, the circle led me to this beautiful piece of music. Sadly, I did not quite muster up the courage to sing the song I had prepared. I didn’t want to get in the way of all the awesome singing that was going on. I figured well…with all the beautiful voices participating in our filk circle, the last thing people wanted to hear was my shaky, awkward performance (yeah, I do the most insane things in the name of comedy but singing a song is the most terrifying prospect in the world). Was everyone incredibly welcoming and encouraging? yes. 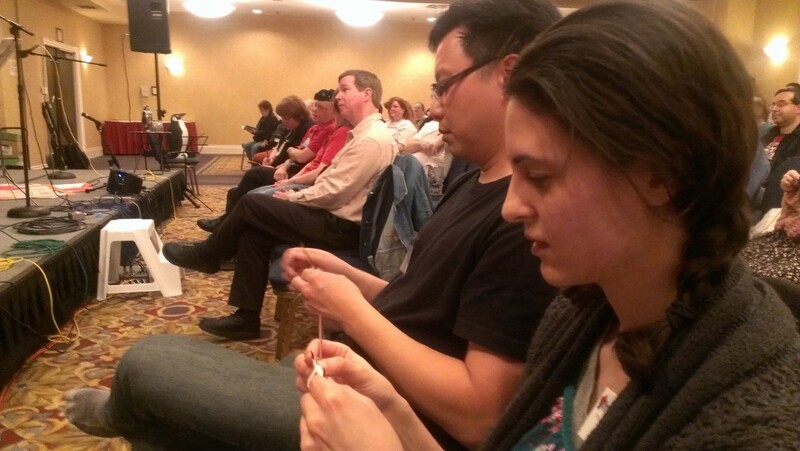 Was there a special Filk circle for those just starting out who might feel too shy to sing and needed some help? Sure was. Did I still chicken out? You bet. On the plus side, we got to dress up. But that doesn’t mean I didn’t have fun. Listening to the songs was fantastic, and there was loads of other crazy traditions to take part in. Like the Auction. Oh, the Auction. I was getting squirmy from sitting so long watching concerts and began to get up. Errol promptly had me sit back down, saying simply “I want you to see this”. What followed can only be described as madness. No, this is not an exaggerration. Imagine Alice in Wonderland. Got that? Good. 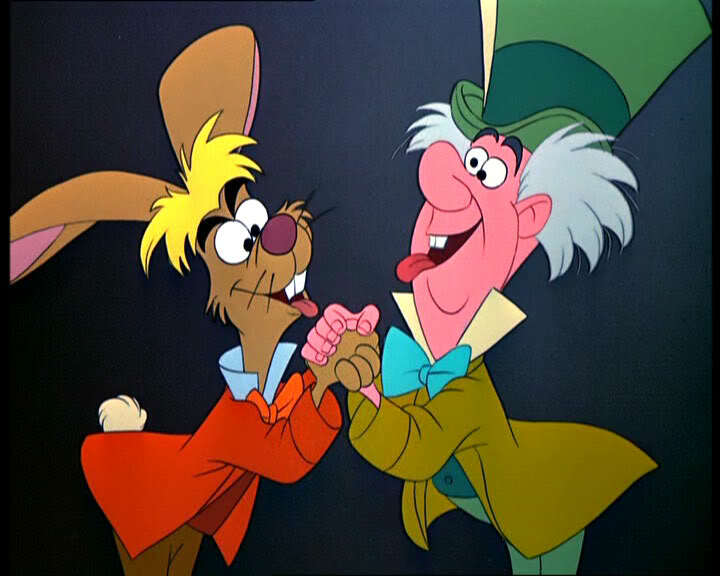 Now imagine the Mad Hatter tea party. Easy enough. Now imagine it was an auction. That is the experience of an FKO auction. It was like living in a cuckoo clock for an hour. Everything was topsy turvy. There was no logic. A brand new banjo sold for $150. A DVD sold for $300. Once the bids started going higher, out of nowhere would come “the wenches”, women who would massage and compliment you in an attempt to get you to bid higher. 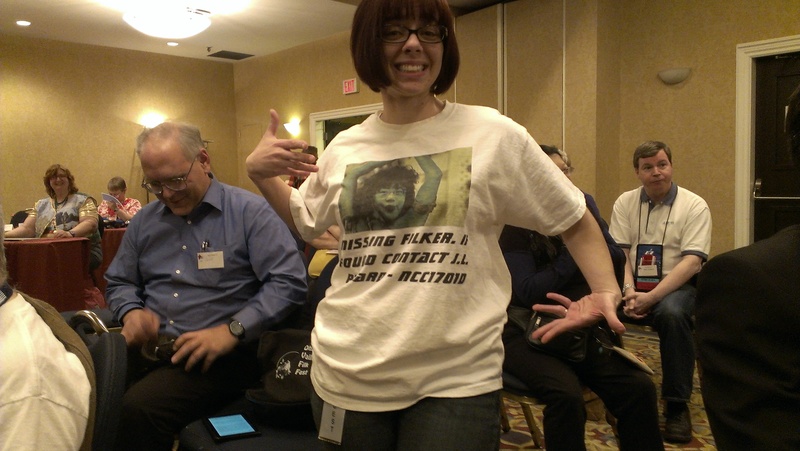 There was even a bid, involving poor great Debbie Ohi, in which the bidders began running around the room declaring secret bids over a t-shirt with a photoshopped Debbie Ohi’s face. 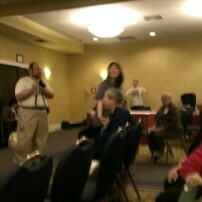 Debbie chased the bidders around the room threatening them with death. The wenches formed a protective circle around the bidders. More insanity ensued. It was easily one of the most entertaining moments of the weekend. Not quite the best though. No, the best moment for me personally was getting to see Errol come as close to speechless shock and embarrassment as I’ve ever seen him come. We were at the banquet (which someone was incredibly kind enough to provide tickets for) and it came time to induct a few long time Filkers into the Hall of Fame. One woman was giving her speech, a woman I had seen Debs and Errol talking to earlier, and towards the end of her speech announced that they had their guests for their convention in Oregon. Debs and Errol. Words cannot describe the look on Errol’s face. I really wish I had a camera for that moment. It’s not one I’m going to forget for a long time. 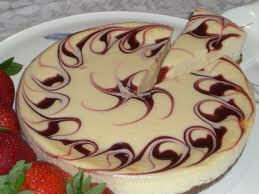 I savoured it much like I savoured this entire cheesecake. All in all, FKO was a ton of fun. If you have a Filk circle in your area, and you love some good old fashion sci-fi/fantasy themed music, I would recommend checking it out. They’re always looking for new members, and you won’t find a more welcoming bunch. Hopefully next year I might actually be able to sing :D.
Posted on April 24, 2013, in ramblings, Writing and tagged filk, fko. Bookmark the permalink. 32 Comments. It was so great to be able to finally hang out with you, ‘Manda. 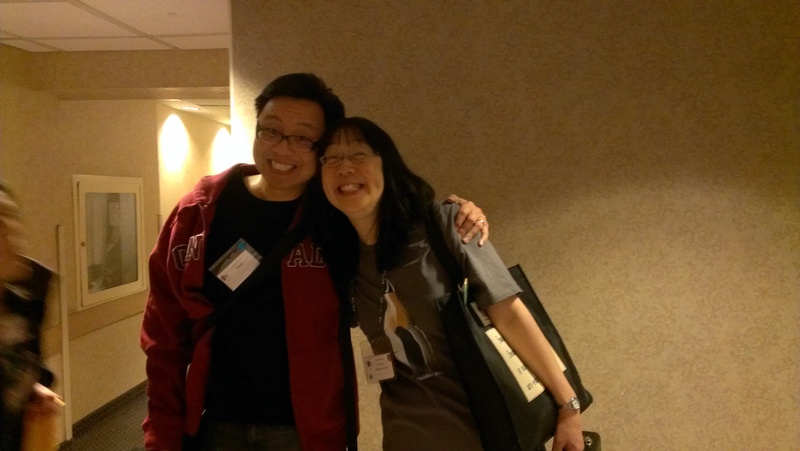 For someone who just attended her very FIRST full filk convention, your overview re: filk experience is amazingly insightful and captures much of the heart of why I love the filk community so much. Ha, oh man, I can imagine. Glad you had a good time. It is si cool to see what my fourth child has become. That would be FilKONtario. After the first one a friend said in his report about it “Heather threw a party for 76 of her friends”. It is so good to know that people can still pick up on that. One little thing though, the DVD? It was a special project of which there was only one made. Ohhh, thanks for the clarification! I’ve corrected it now :D. Thanks again! I’m so glad you had a good time. I’d say you got it all exactly right – that feeling of community, and of making everyone welcome as both listeners and performers, is what I most love about filk. Since I’m the one who ran the Shallow End circle, and was one of the auctioneers, you hit a couple of things that are most meaningful to me. I hope we see you at future cons, and I get the chance to actually meet you. And if you want to sing something, we’re there to help. Aw, thanks Mark! and yes, the auction was immensely entertaining! I met Errol at FKO 4 years ago and have been following him (and you, because it is tough to follow him without learning about you) online ever since. Hahaha, I think it’s hard not follow Errol in general. He’s EVERYWHERE! And I’m sorry we missed each other too! I’m sure I’ll run into you at some point! Some day! So glad you had a good time! And if next time you also want to sing something, you’ll be very welcome to do so. I look forward to meeting you in person someday. Thanks! I enjoyed your songs! I’m so glad you loved your first FKO. We haven’t met, but I was vectored here from Phil Mill’s blog post where he mentioned you. I tend to come to OVFF and I sometimes run the Floating Filk Convention on the east coast. Thanks Merav! Phil is awesome :D. And yes, it’d be awesome to make it to other cons! Thanks Peggi! Was so good to meet up with you again! Yes, hopefully i can make it out to the next event! Wonderful post, Manda! It was fun sitting beside you at the banquet and start to get to know you! 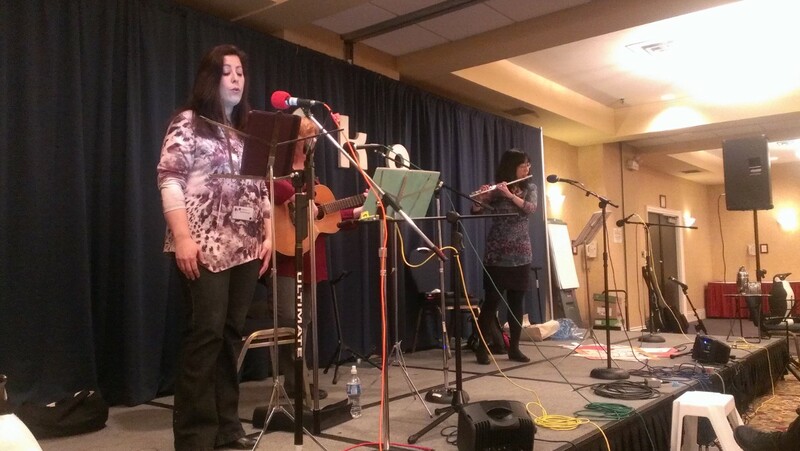 Hope to see you again at a local filk soon! Can’t wait to hear you sing! Thanks Alison! It was a lot of fun getting to know you! Manda, welcome to the family. There are filkers who’ve been around for a while who could not describe what we are and do so clearly and lovingly. Your blog entry has been linked all over the place. Thank you! Thanks Judith! You guys did a fine job! Manda – your comments regarding your new found tribe is why I came up with the idea that ended up being the Filk Hall of Fame. It was the filk community. I cannot thank you enough for your blog – which re-inforces this. Again, thank you, and welcome “home”. Thanks Dave! I had a great time and look forward to future visits! Hi Manda, and welcome to the insanity. I don’t get to many filk cons right now, due to finances and health, but I hope to see you at some of the NEFilk cons, which occur in June on a rotating basis (I think this year is the Baltimore/Washington, DC incarnation. Next year is the NY/NJ version, and 2015 should be the Massachusetts one). I’m really glad you enjoyed the Interfilk Auction. Again, welcome to the insanity. And thank you for the excellent con report. Hello otherdeb! It would be good to meet you! Sadly, I’m fairly impoverished, so it’s not often I get to make trips to the states. But someday! Good to know there are other listeners out there! Hello, Manda! Your observations mirrored the ones I made about a decade ago, when I started hanging out at these things in earnest. The whole intimate and accepting nature is a Very Big Part of why I keep coming back. Thanks Dave! It’s good to know it’s a universal feeling! Oh, hey, and I’ve got to say I was pleased that you liked that UT cover of the Game of Thrones song well enough to look it up yourself! 🙂 That’s the video I first watched, too, that made me go right to Deb and Jodi and say “We have to learn this.”. Oh it was awesome! I have it on my phone now. I like to listen to it and look dramatically off into the distance while passersby stare awkwardly.